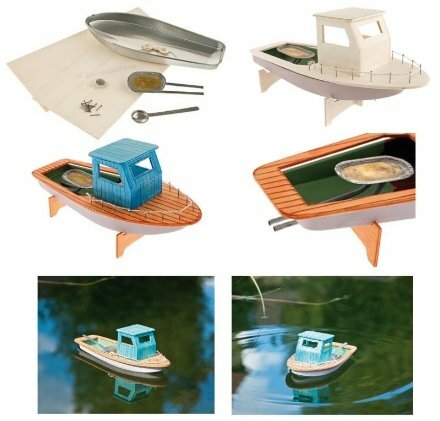 Pop Pop Fishing Boat Kit. A complete kit including live steam. (Download instructions below). Full dimensions below A complete kit using a pre formed metal hull. 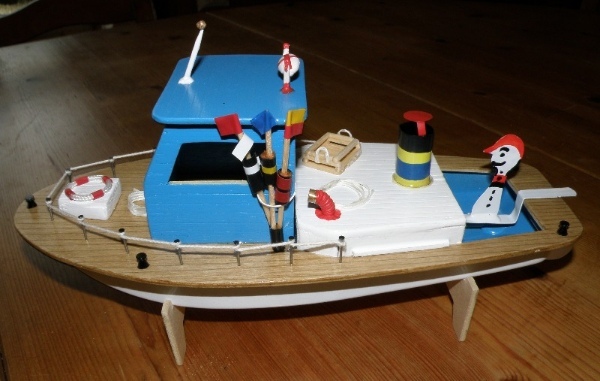 Pop pop boat engine included along with fuel holder, priming dropper and candle. Quality "Grade One" Plywood boards are used to construct the deck and cabin. A template is provided to trace and then cut out the wooden shapes. Paint and design your own working steam model. Tools required - Fretsaw, Drill, Hammer, Strong Glue ( eg Araldite), Paint to complete your kit. Hull dimensions - Total length - 10 inches (26cm) approx. Width - 4 inches (10 cm) approx - at widest point. Deck - Total length - 11 inches (28cm) approx. Width - 4 3/4 inches (12 cm) approx - at widest point. Jean from France. A fantastic model with some extra bits and plenty of colour. Pop Pop Boat Engine - standard.